3D printing is seeing accelerated adoption in the workflow of manufacturing processes all around the world. Think of tools, molds, jigs, fixtures, cutting patterns but also on-demand production of spare parts. There are numerous applications and even more being discovered every year. As of late, 3D printing has moved past the prototyping and one-off era and is now shifting rapidly towards small to midsize volume production of end-use parts. Yes, 3D printing is a production technology and yes, 3D printing is competing with traditional production processes for small batch and bridge manufacturing. Why a slow adoption rate? While these concerns were once valid, 3D printing has come a long way since in a very short time. Additive manufacturing companies are constantly improving each of these issues (and in many cases have already overcome them). Print speeds have seen a prolific increase in recent years with new technologies constantly pushing the envelope. Where once, watching a 3D printer in action used to elicit the same level of excitement one would get watching mushrooms grow, nowadays you can have a 3D printed part in your hands within an hour, or even minutes. Carbon’s Digital Light Synthesis technology is groundbreaking and probably the fastest resin printing method in the world. Its continuous printing method is way faster than traditional DLP and peel resin printing methods. BigRep’s new Metering Extruder System (MXT) has the ability to print up to 400 cm³ per hour. The MXT technology gains better control over the amount and speed of material that is extruded by separating filament feeding and melting and molten extrusion. Essentium’s High Speed Extrusion platform has the ability to print with 500 mm/s, which is 10 times faster than your average FDM 3D printer, without compromising accuracy and even increasing z-strength. HP’s Multi Jet Fusion 3D printer utilizes a ‘print bar’ with 30,000 nozzles spraying 350 million drops per second. This makes HP’s 3D printers 10 times faster than other powder bed fusion 3D printers. The LightSPEE3D is a metal 3D printer that uses supersonic 3D deposition (SP3D) to process metal powder through a nozzle on to a print bed attached to a robotic arm. This arm moves along five axes and achieves some of the highest speeds in all of 3D printing, particularly that of metal additive manufacturing. The printer has been a valuable component for modern automotive, mining and research applications. Materials development, certification and registration are a crucial part of the manufacturing and 3D printing industries. The process of developing and registering materials varies from industry to industry and standards can vary from one functionality to another. A large chunk of the automotive industry, for example, uses only those materials that are listed in the International Material Data System (IMDS). Aside from the proliferation of traditional filaments, resins and powders, there are a number of new developments currently making their way through the materials industry. Aside from the improvements in hardware and software, there is a massive race to develop systems that can process new metals, thermoplastics and even natural, sustainable materials. The new revolution is the materials revolution. There are all sorts of organizations that monitor the applications and certifications for thermoplastics, metals and any other materials. These organizations include but are not limited to the Food and Drug Administration (FDA), Underwriters Laboratories (UL), the International Organization of Standardization (ISO), United States Pharmacopeia (USP), International Electrotechnical Commission (IEC) and ASTM International, formally known as the American Society for Testing and Materials (ASTM). Medical 3D printing undergoes a lot of the industry testing and certification by the organizations described above. One recent and notable example is in Carbon’s Medical Polyurethane 100, which received both USP and ISO certifications. USP tests materials for quality, purity, strength and consistency, while ISO tests for safety, reliability and quality. Another good example of certified printing materials can be seen in how HP’s thermoplastics received various UL certifications. There is a bit of confusion about multimaterial 3D printing and what encompasses this particular field. Multimaterial printing in this case means two different classes of materials merging together under the same process. While certain FDM printers can process a regular material and, for example, a different dissolvable support material, this is not what the industry generally considers when discussing multimaterial applications. Similarly, combining two different metals in one print is very different from combining two polymers in a similar heat range, even if they are processed simultaneously. This is due to the very different conditions each metal may require compared to the relatively similar conditions for most printing polymers. While these sorts of multimaterial applications are still in their relative infancy, the field has shown immense promise with a number of different technologies. It’s not that hard to see why. Technologies such as LENS can combine disparate materials like metals and ceramics in a single flow, allowing for a production method that is as close to a post-assembly final product as currently possible under a single machine. Using more than one material in a single 3D printing process also eliminates the need to use adhesives or other connections between joints that are currently required when fabricating multimaterial objects in this way. The seamless integration of materials opens up the field for entirely new designs and functionalities, such as building new alloys and stronger composites. LENS and other laser based multimaterial applications are particularly useful for the aerospace and automotive industries. While the multimaterial processes that are most popular are ones based on lasers and heat, there are other means as well. SMaLL, aka Solution Mask Liquid Lithography is a new technology that can combine polymer resins of varying wavelengths in one flow. This is a very complex process similar to DLP or SLA but can achieve varying properties within a single print using materials with vastly different processing conditions. 3D printed parts are getting certified more and more. Improved 3D printing techniques and post processing have mitigated the quality issues additively manufactured parts previously faced. Closed loop 3D printing systems are a big step towards getting certified 3D printed parts. A closed system detects any missed steps in the print process as the machine keeps track of where it is and where it should be. While printing, a stepper motor could occasionally miss a step which means that an entire layer of the print and, as a result, every subsequent layer will be just slightly off, resulting in an end-part which might look like it should but doesn’t have the mechanical properties it should have. As 3D printing edges towards production of functional parts in industries like healthcare, automotive and consumer products, there is a distinct need to produce flawless end-use parts. One major disadvantages of 3D printed parts has been that of z-strength. 3D prints have a weaker layer strength on the z-axis due to the fact that, unlike the X and Y axes, the Z-axis is not extruded continuously but rather layer by layer upwards. This layer delamination has been an important reason why 3D printing wasn’t considered as a production technology. Isotropic strength varies across different additive manufacturing technologies. Since FDM works with successive layers relying on mechanical adhesion, it has weaker isotropic strength in the z-axis. FDM prints are also pervaded by microscopic voids and holes. Some companies are looking to improve this facet of 3D printing. One such way is Essentium’s FlashFuse thermal welding technology. The process passes an electric field to fuse the layers together after laying them down. This lets them melt together and become far more cohesive overall compared to normal FDM material extrusion. Traditional resin-based printing techniques that use photo polymerization typically produce weak, brittle parts. Carbon overcomes this issue by embedding a second, heat-activated programmable chemistry in their materials. Once a part is printed, it’s baked in an oven. The heat of the oven sets off a chemical reaction that causes the materials to adapt and strengthen. This results in isotropic parts with an exceptional surface finish. Similarly, SLS machines sinter polymer particles together rather than depositing plastic extrusion, there is much less directional dependency on material properties. In general, SLS machines can achieve better isotropy at lower temperatures as compared to most FDM machines. Modern printing techniques can create surface textures that are impossible to duplicate with traditional manufacturing. These can be particularly advantageous in industries such as automotive and cosmetics, where what would often be considered secondary characteristics, become a crucial selling point for a product. Things like the feel, grip and smell of an object. Applying texture to a part or a product often requires costly and complex etching treatment to a mold or laborious post-processing on the part itself. Aside from matching the mechanical properties of injection molded parts, Carbon also tout the ability to create entirely new textures with interesting properties such as low-friction or hydrophobicity. Additionally, their DLS process can create shapes with detailed curves and unmoldable textures. ESD (electrostatic-sensitive device) safety is one of the concerns companies have with 3D printed parts, particularly those dealing in electronics. ESD safety can allow for the printing of electronic devices without the worry of getting electrostatic interference that can potentially cause device failure. There are two ways to ensure ESD safety: the first involves spraying a conductive polymer solution onto an object, whereas the second involves the use of plastics that have conductive material in their structure. An example of an ESD-safe filament is Essentium’s PCTG Z. This is an easy to print, non-marring material with a high impact strength. There are so many tried and true production technologies out there, so when do you choose 3D printing? What unique advantages does it bring to the table for manufacturers? 3D printing allows for geometrical structures that are impossible to create with other production technologies. When design for printability (DFP) is done right, it enables you to merge certain parts of a product which can decrease assembly time. It also enables you to create custom infill / recesses which can lead to lighter, stronger parts and a reduction in material cost when compared to subtractive manufactured parts. With 3D printing you can create surface textures deemed impossible with other production technologies. A variety of digital applications allow designers to pursue all sorts of crazy ideas with utmost precision in their minute details. With injection molding, tooling usually takes 12-16 weeks. With 3D printing you can start production right away. 3D printing shortens design and production cycles compared to traditional methods and increases the speed of delivery. The ability to localise production brings more of the manufacturing process inhouse, allowing for reductions in inventory and in the footprint (environmental and physical). Additionally you keep intellectual property inhouse. With localized production, companies can produce without over-reliance on external parties. By its very nature 3D printing allows massive potential for patents. However this only works if the patent can’t be designed around, so take professional advice before wasting time and delaying the development process. As a production method, 3D printing shines as an economical means for small to midsize volume production of end-use parts. Below are 3 cases where 3D printing drastically altered the manufacturing approaches of various companies. One prominent and very indicative case study is that of the Vitamix rinsing nozzle printed with Carbon’s M2. Vitamix partnered with Carbon to redesign a specialized nozzle used for rinsing commercial blender containers in a store setting. This nozzle was originally designed for the injection-molding process, using multiple pieces that required tedious assembly. Thanks to a design for printability approach the end-result was a ten times more durable, mass-producible nozzle which uses 30 percent less material and is 33 percent more economical. Instead of 6 pieces the nozzle now consists of just a single piece. 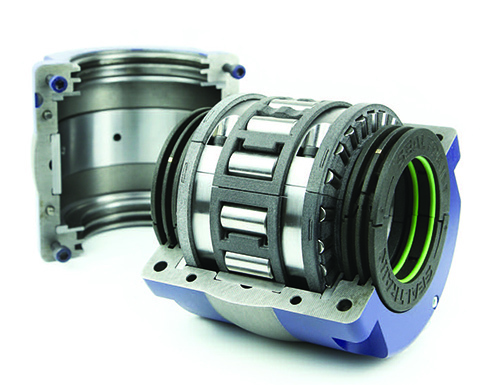 John Handley Bearings teamed up with Bowman to design a new range of split roller bearings. These bearings are an important factor in heavy-duty industrial sectors like mining and quarrying due to its ability to improve efficiency, reduce downtime and increase production. The cage of these split roller bearings, named ‘Rollertrain’ is designed by Bowman and is entirely 3D printed. The Rollertrain is designed with 3D printing in mind which allowed them to reduce space of the rolling elements compared to traditional “cap and body” cage designs. The additional space around the roller track now incorporates up to 45 percent more rollers than existing bearings. This results in an increased radial capacity of 70 percent and an increased axial capacity by a 1,000 percent. The fitting time for Rollertrain cages is slashed by 50 percent. Additionally it’s worth mentioning that 3D printing is the only manufacturing method capable of bringing this concept to reality in an economically viable way. There has long been a perception that 3D printing is only suitable for prototyping and one-offs. A misplaced sense that 3D printing is too expensive and 3D printed parts don’t have the right properties have contributed to the idea that additive manufacturing isn’t up to the task of being used as a production technology. When it comes down to small and midsize volumes, 3D printing is set to continue to outpace traditional manufacturing methods. Curious about how 3D printing can benefit your business? Look no further than our own additive manufacturing consultancy.